Day 2 in Durban is basically dedicated to heading to the expo to pick up race numbers and to make sure everything is in order for Sunday. It’s important to get all of this done as early as possible so that I can concentrate on relaxing the mind and body and knowing that Friday is taken up by course tours. It’s also the easiest time to pick up bibs as the crowds apparently are at their lowest on the Thursday with many either working or still in transit. Standing in a queue is not everyone’s cup of tea, but it’s all part of the Comrades experience. Fortunately this year I didn’t have to wait around with 17 kilograms of luggage in tow just to make myself look ultra awkward, but the line was already large and growing by the time I got there 20 minutes before the 10AM opening. Once the expo opened though the line orderly and rapidly were able to get inside the Durban ICC building to begin the process. First up for me was getting a brand new timing chip. For those unfamiliar with Comrades but used to entering other timed events around the world other than Parkrun (more on that later), the chip for this event has to be worn on the shoe rather than attached to a bib, or in the case of Comrades, either bib. I’m sure the chip I had from last year is still at home somewhere, for once you get a bib it’s yours to keep and to reuse for future events. Having spent the money I probably needed for some lunch on the chip and the bus ticket to the start (most of the expo was cash only), the only other thing I did was to listen to a quick lecture on race strategy that I felt I needed to listen to, especially with a course tour on the Friday morning coming up to confirm the plans. 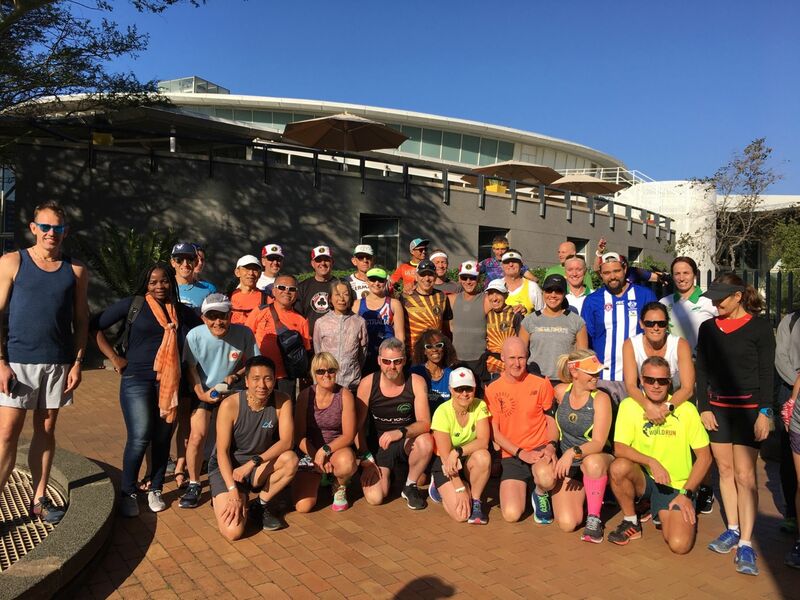 I left just after 12:30, heading in the right direction this year after last year’s self inflicted confusion back to the motel, before returning to the Durban Hilton located across the road to have a lightish training run with about 40 of the internationals. The lesson learnt from that run was that Durban motorists have a concept of red lights but not much else when it comes to traffic lights. We’re from around the world about to tackle Durban’s traffic.